We've picked out the ten best Nikon cameras you can buy right now, and we're not just going by features, price and performance, but by affordability, ease of use and how good these cameras are for different users and picture-taking situations. Nikon makes three main types of camera. 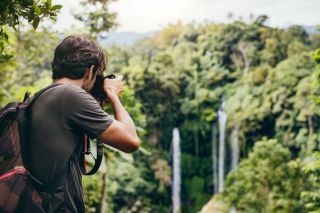 It's probably best known for its interchangeable-lens DSLRs, as these come in prices to suit beginners right up to full-time professional photographers. But it's recently added two new mirrorless 'Z' models which have really caught everyone's imagination, and we've included these in our list too. But Nikon isn't about fancy interchangeable lens cameras. Not everyone needs the ability to change lenses, and for family or casual use a fixed-lens 'compact' camera will do just as well, and probably save some cash in the process. These fall into the Nikon Coolpix range, but this also includes some interesting and specialised models such as ultra-zoom bridge cameras and rugged 'adventure' cameras that can stand being submerged, dropped and frozen! So we'll kick off our list with the top Nikon cameras you can buy right now based on features, capabilities and price, and we'll go on to look at the best Nikons for more specialised kinds of photography. Ready? Let's go! All-round winner: the Nikon D3500 brings quality, versatility and value! It's the entry-level model in Nikon's DSLR range, and on paper it doesn't look so very different to the Nikon D3400 before it (which is still on sale). But subtle design tweaks have produced improved on a winning formula to produce a camera that's small and light, yet comfortable to grip. It's an entry-level model but it has a 24.2MP sensor as good as those in cameras at twice the price, and it offers a very good 5fps continuous shooting speed for a beginners camera. The Guide mode will help beginners get started and understand the basic priciples, and the D3500 has all the manual controls you need to learn about photography as you improve your skills. It's sometimes sold a little cheaper with a non-VR (non-stabilised) kit lens, but it's definitely worth paying a little more to get the VR version and sharper shots in poor light. This is the cheaper of Nikon's two new Z-series mirrorless cameras, but it's the one we reckon has the most all-round appeal. Yes, it's expensive compared to the D3500, but that's because it has a much larger full-frame sensor, more powerful image processing, a faster continuous shooting speed, 4K video and a host of other features that mark it out as a superb camera for advanced enthusiasts and professionals. On paper, the 24.5-megapixel sensor appears to offer no advantage over smaller and cheaper APS-C cameras, but the sensor's extra size means it's images are much crisper and cleaner, especially at higher ISO settings. At the moment Nikon has only released three native Z-mount lenses – we recommend the Nikkor Z 24-70mm f/4 as the perfect kit lens – but more are on the way, and if you get this camera with Nikon's FTZ mount adaptor, you can use any current Nikon DSLR lens without restriction. There are plenty of people who will tell you that DSLRs are dead and mirrorless cameras are the future, but don't believe a word of it! The Nikon D850 is a big bruiser of a camera compared to the new Nikon Z models, but that works in your favour if you're shooting with big, heavy lenses. Being a DSLR it has a bright, clear optical viewfinder that many photographers still prefer over a digital display, no matter how good. The D850's 45.7-megapixel sensor produces quite superb image quality, yet it can still maintain a shooting speed of 7 frames per second, or 9 frames per second with the optional battery grip. Even without the grip, the D850 has an amazing battery life of 1840 shots – far more than any mirrorless rivals – and it comes with two memory card slots; one for the new XQD card format and one for regular SD/SDHC/SDXC. Can you really get a decent digital camera for so little money? Yes you can! Obviously the budget price brings compromises in sensor size and image quality, but you still get a 5x optical zoom lens, a decent 2.7-inch screen and a simple control layout that means anyone can just pick it up and use it. We love the fact that it runs on a pair of regular AA batteries, too, so that if it runs out of power you can just get a couple of replacement batteries from any nearby shop. Its continuous shooting mode is a bit too slow to be much use, and it can only capture 720p video, but at this price you've got to accept a couple of compromises and the A10 ticks all the boxes for a low-cost family camera. It's been around for a while, but the D7200's combination of image quality, features and performance has proved an evergreen formula, and falling prices make it as desirable as ever. It doesn't excel in any one particular area, but it's strong in all of them, so it's the perfect all-rounder for students of photography or beginners who want to move on up to a more serious camera. Interestingly, the D7200 has a 4-megapixel resolution advantage over the more expensive, newer Nikon D7500 and D500. The newer cameras are optimised for speed and low-light shooting, but the D7200 still has the edge for fine detail. It comes with Nikon's long-running and highly-regarded 51-point autofocus system, and while it doesn't have the tough magnesium alloy construction of more expensive Nikon DSLRs, it's still plenty tough enough. The only thing that betrays its age is the lack of 4K video, but not everyone needs that. The Z7 is Nikon's first full-frame mirrorless camera, but it's an instant classic. It combines an ultra-high-resolution 45.7-megapixel sensor with a 493-point hybrid autofocus system and the ability to capture images at up to 9 frames per second (without needing a battery grip). In many ways it surpasses our top pro Nikon camera, the D850, though its use of just a single XQD card slot has proved controversial and it has a much shorter battery life. In many ways, the Nikon Z7 vies for the title of top pro Nikon alongside the D850, but we think it's especially well-suited to landscape photography, where its smaller body and lighter weight will be very welcome when you have to. hike long distances (just make sure you take a couple of spare batteries). Nikon's D3000-series cameras (like the D3500 above) are entry-level cameras designed for beginners, while its D5000-series cameras are one step up, offering more features and a more adaptable design, with a flip-out rear screen that can be angled in any direction for low-level shots or any other kind of awkward angle. The D5600 uses Nikon's tried-and-tested 24-megapixel APS-C sensor which is capable of super-sharp results, and it comes with the same neat retracting 18-55mm AF-P lens as the D3500. The 'P' in the lens name refers to Nikon's stepper motor autofocus technology, and Nikon lenses with this not only offer fast and silent autofocus, they also seem to speed up the live view autofocus, which DSLRs are not normally very good at. If you are going travelling, we recommend getting Nikon's small and light AF-P 10-24mm ultra-wide-angle lens too – it's perfect for interiors, tall buildings and narrow city streets. If you're keen on action photography you need four things: very fast continuous shooting speeds, a big memory buffer capacity so that you can caputre lots of shots in a burst, a fast and powerful autofocus system, and a good viewfinder. The D500 ticks every box. Being an APS-C format camera it's a lot (a LOT) cheaper than the full-frame Nikon D5, but comes close for rugged build and performance and the smaller sensor adds a handy 1.5x focal length magnification which effectively increases the 'reach' of telephoto lenses. The D500 uses Nikon's new and highly-rated 153-point autofocus system, and the optical viewfinder offers the lag-free viewing you need for following fast-moving subjects. You are paying a little extra for a tough, fast, sports-orientated camera, but the D500 is also perfectly adept at handling any other kinds of subjects, so it's far from a one-trick-pony. Best for adventure: the Nikon W300 can survive anything you can! Big, heavy cameras don't do well in extreme environments. If you're skydiving, surfing or plunging off watery precipices in a kayak, you need a camera that's small, light and tough. There are plenty of GoPro-style action cams to fit the bill, but the Nikon Coolpix W300 is a 'proper' camera with a 5x zoom lens, a 3-inch screen, and camera controls you just don't get on an action cam. Its 1/2.3-inch sensor can capture 16-megapixel stills and 4K video, and it's impressively tough. It's waterproof to a depth of 30m, which is impressive enough, but it's also shockproof, being designed to withstand being dropped from a height of 2.4m. It doesn't shoot raw files, which is a pity, but then that is pretty uncommon in this class of camera, and hardly a deal-breaker. Best ultra-zoom: The new P1000 zooms further, but the P900 is a lot cheaper! Sometimes last year's technology offers the best value for money, and that's certainly true of the P900. When it was launched its 83x zoom lens made headlines, but Nikon's newer (and much more expensive) P1000 goes much further with its trillion-times zoom, or whatever it is. The fact is, though, that an 83x zoom is still A LOT and you might not find many situations where you actually need that kind of magnification. In fact, we think the P900 hits a sweet spot of zoom range and price that the P1000 currently misses by a mile. You get a 24-2000mm equivalent zoom range, a five-stop Vibration Reduction system to control the inevitable camera shake at long range and there's even in-built GPS. The P900 doesn't capture raw files, but the small sensors in these ultra-zoom cameras put a cap on image quality anyway – which is all the more reason to choose the cheaper P900 over the newer, bigger and more expensive Nikon P1000.